This past October marked the beginning of catalogue of anniversaries in our journey through Andrea’s cancer treatment program. At one point I’d worried the anniversaries would be hard and emotional. It turns out they’re rewarding and invigorating because of Andrea’s resilience and good health. It’s like we have a second chance at life. Today is a particularly significant anniversary. 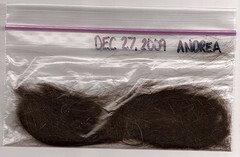 WeCanRebuildHer was launched one year ago, today, following Andrea’s head-shaving party the night before. The party was such an important milestone in our journey that I’ve kept some of Andrea’s hair from that night as a souvenir. To play with the text in the first post, we invite you to follow our journey through life as a family that has survived the cancer treatment process. We’ll continue to blog our experiences and thoughts and share audio, video and photographs of the process of enjoying life together. And just in case you haven’t seen it yet, here’s a video we put together from the head-shaving party. As noted at one point in the video, our then-8-year-old was the videographer. Thank you, Mark. For everything.nnUnfreakinbelievable the difference time, healing, love, medicine and magic can make.nnI am completely overwhelmed with gratitude. For the lessons I have learned through this challenge. For the deeper friendships I have made. For the courage and love that got us from there to here. And for the gift of life.nnIn the midst of the news, the surgeries, the injections and side-effects, I had completely forgotten what normal, happy, healthy life was like. I couldn’t even imagine it. nnAnd, here I am again. Healthy, strong and happier than ever. And last year seems like a foggy, disturbing dream.nnI’m going to put a huge effort into seeing the lingering physical diminishments that cause me frustration and self-pity as reminders to absolutely enjoy every minute of my strong, healthy, relatively pain-free body and this fleeting and fabulous life.